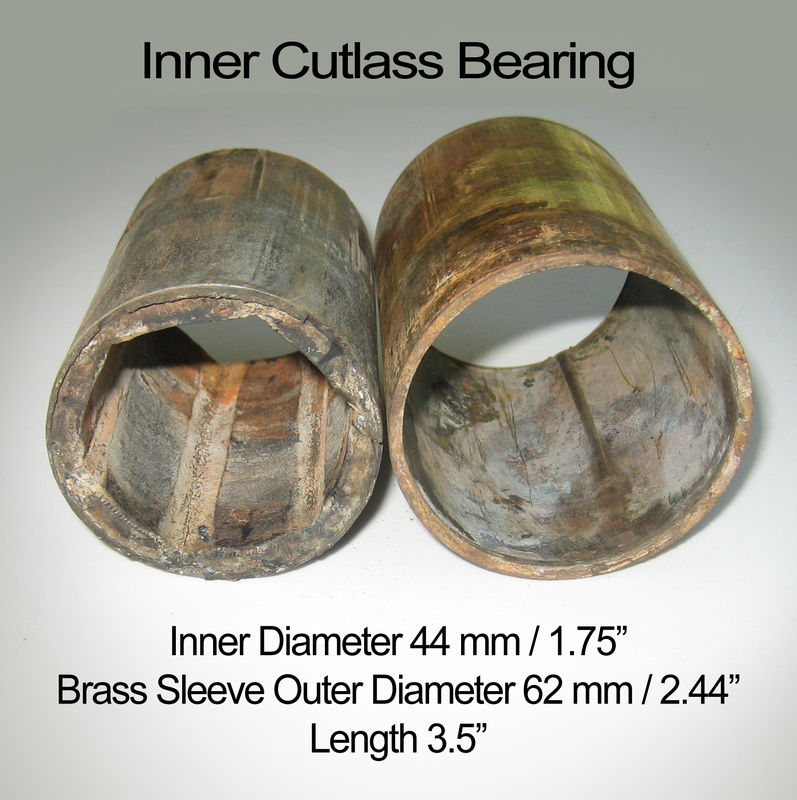 Technically, three bearings, and it begins with that original cutlass bearing. Looking back, that should have been the first sign that some unusual headaches would await us down the road. 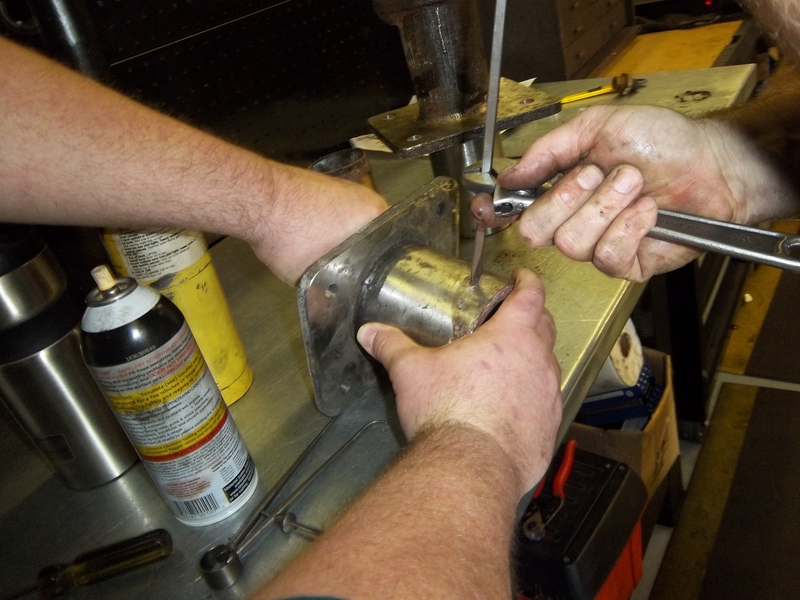 Back when we were buying Annabel Lee, the initial attempt at a sea-trial revealed a severely worn cutlass bearing, and the seller needed to replace that as one of the conditions of the sale. Simple enough? Apparently not, as days stretched into weeks and we were told the mechanic he’d hired to do the work was having difficulty locating a proper sized replacement. In truth, being that it was October and haul-out season was in full swing, we believed the delays were more a case of this job falling on the low end of the mechanic’s priorities, and being that it wasn’t our boat yet, things were out of our hands. Eventually a bearing turned up, I’m told, when the seller discovered he had a spare he’d completely forgotten about aboard. But the job was completed, the sea-trial and survey wrapped up, (including an inspection of the work by the surveyor, who completely overlooked the fact that the mechanic had installed the rudder tiller upside down, which led to another string of headaches, but that’s not today’s topic.) 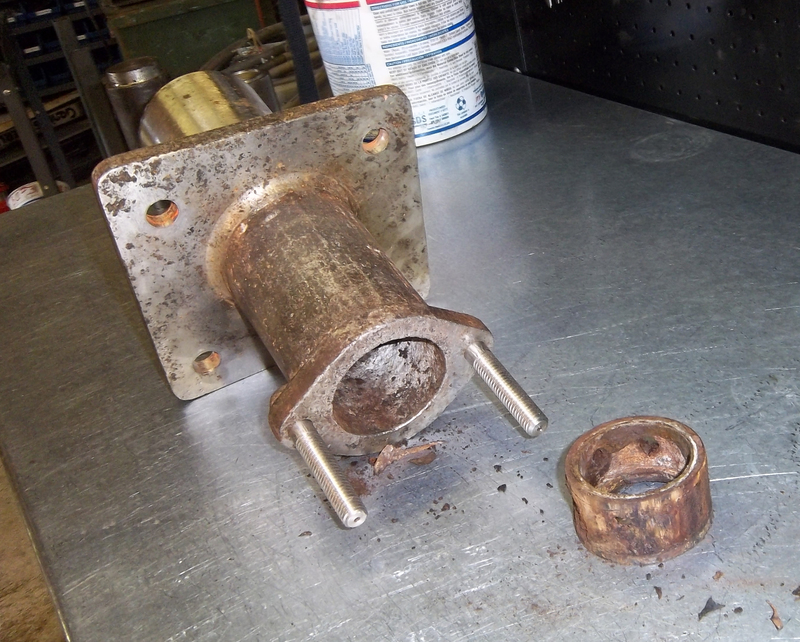 We’ve learned several lessons from that experience, including the realization that if no one could locate a bearing for a boat with a 1.75″ shaft, that might be a cause for consideration. Move ahead a bit and we find ourselves working out various other mechanical kinks, including a stuffing box with a worn inner cutlass bearing (yes, they do exist) and numerous steering issues, including a rudder with (among other things) a bit too much play from a worn lower bearing. 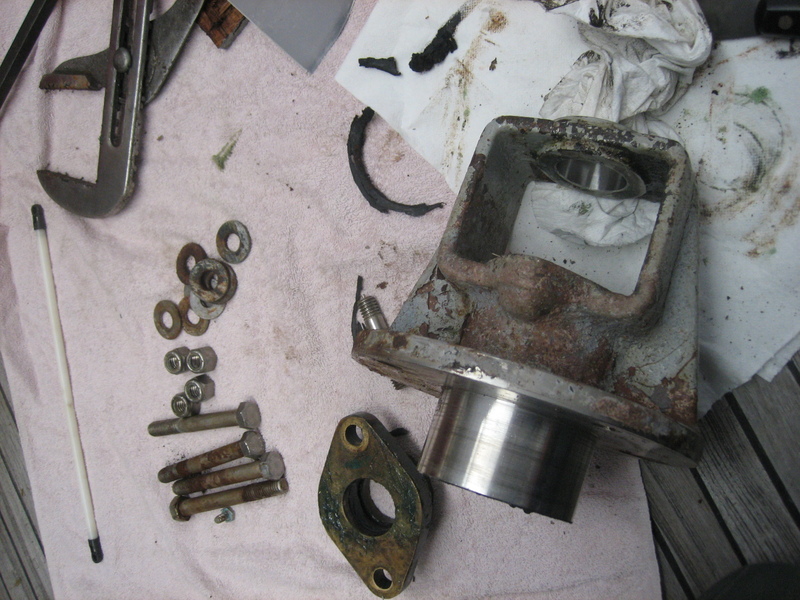 As with everything else on this boat it took some doing, (and thoughts of dynamite for more than one reason,) but ultimately we removed both the stuffing box and the rudder bearing with the innocent and simple intention of replacing both bearings… and that’s where things got interesting. Let’s start with the rudder. Yes, this is the rudder on a 32′ powerboat. But as with everything else on this miniature ship, it is overbuilt. 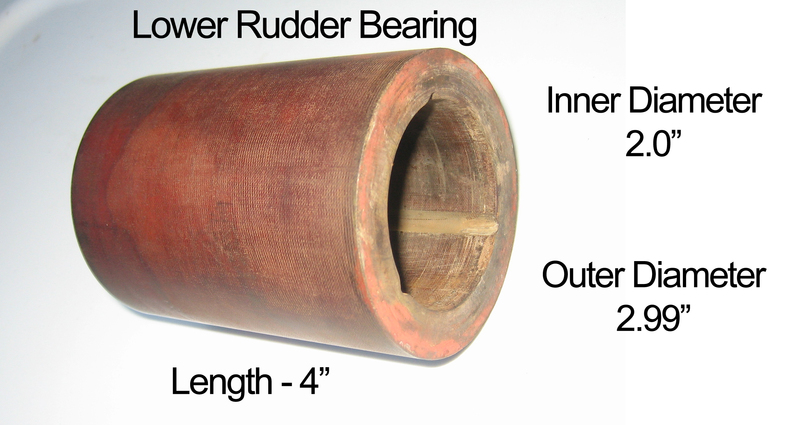 The rudder blade itself measures 20″ wide by 34″ high, and if you take the shaft into consideration that brings the total length to 59″. There’s even a removable deck plate in the cockpit that allows you to insert a manual ’emergency’ tiller onto the squared end, should the hydraulics fail. Details like this are among the reasons this boat, despite the work she needs, impressed me to begin with. 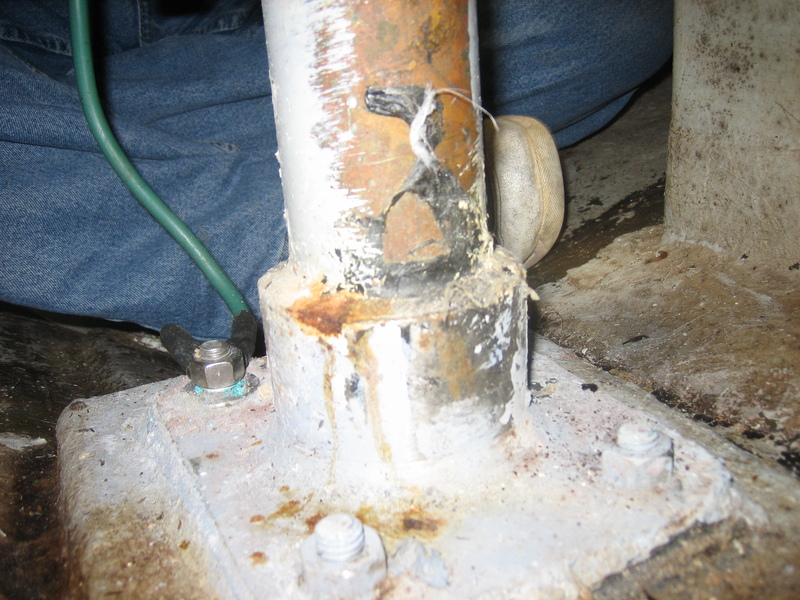 Rudder tube leading to lower bearing. 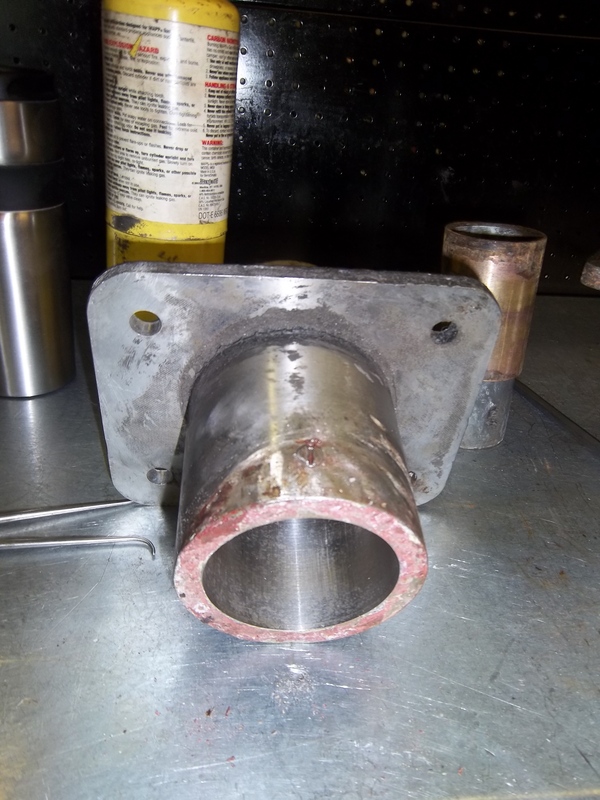 Lower bearing housing coming out. 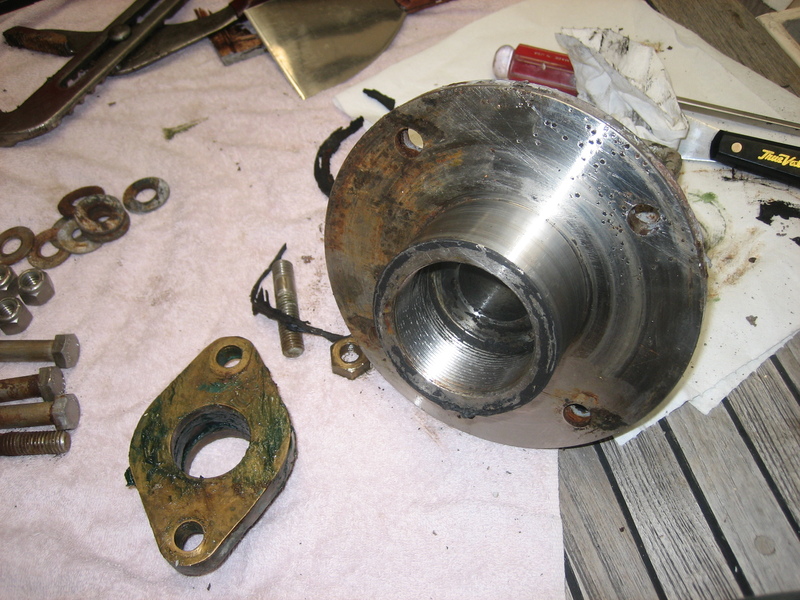 Above: Lower bearing housing removed. Above: You might think there would be a set screw or two to keep the bearing from spinning, but there were none to be seen. 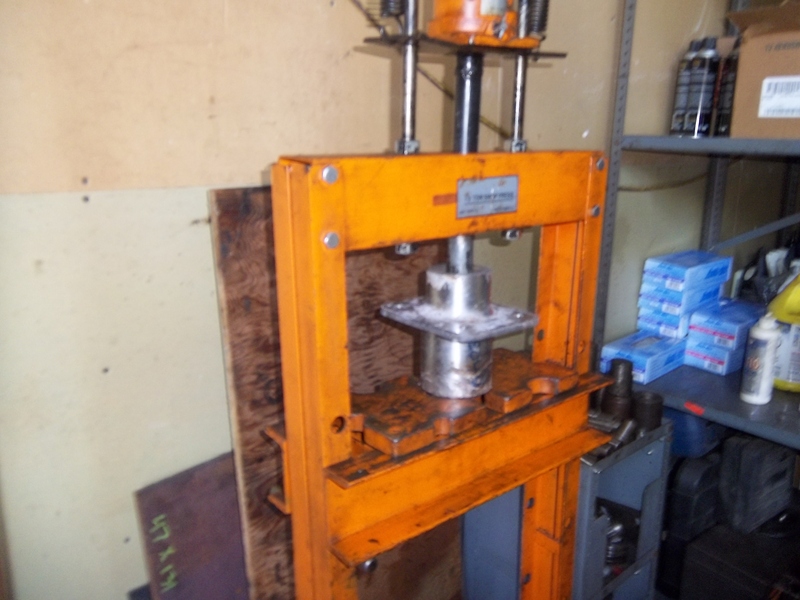 Still, the bearing didn’t wouldn’t separate from the housing until we resorted to a hydraulic press. The tube is clear. And here’s the first bearing I’m trying to locate. It seems to be made of some hard composite. 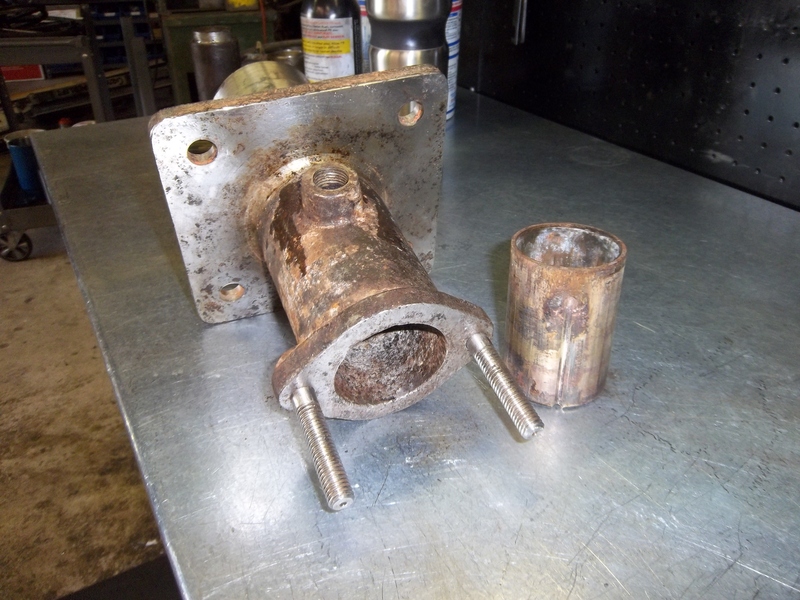 And that brings us to the stuffing box. 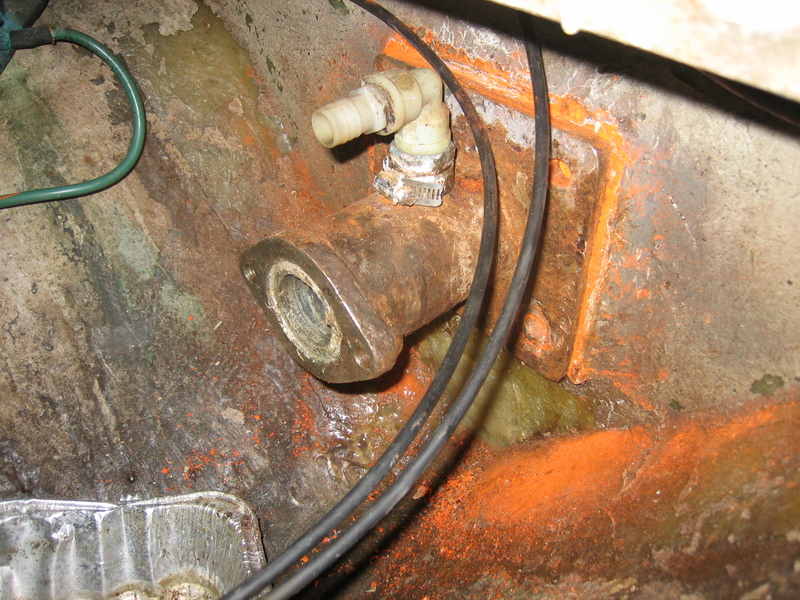 The orange dust you see here is called ‘Phillybond’, a flexible stern tube sealant. 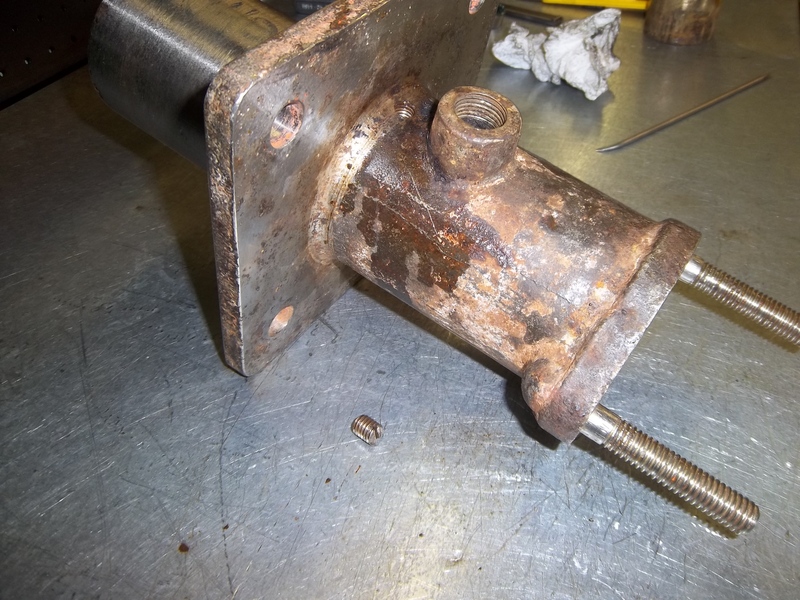 It turns out that in addition to being bolted into the hull, the stuffing box was also threaded onto the stern tube, and sealed with Phillybond epoxy as well. Another view, to show just how deep this is set in. First round with hydraulics only managed to remove the very much crudded-up collar that (theoretically) directs water around the shaft, but not the cutlass sleeve. But why was it so hard to remove the sleeve? Perhaps another hidden set screw, also hammered down and ground smooth then covered under years of age? There it is. 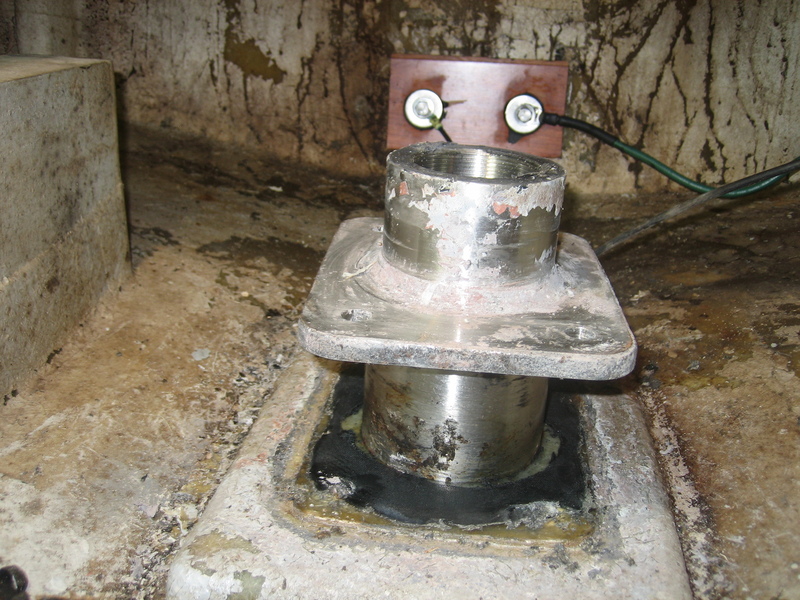 And here it is, the reputedly non-existent inner cutlass bearing. 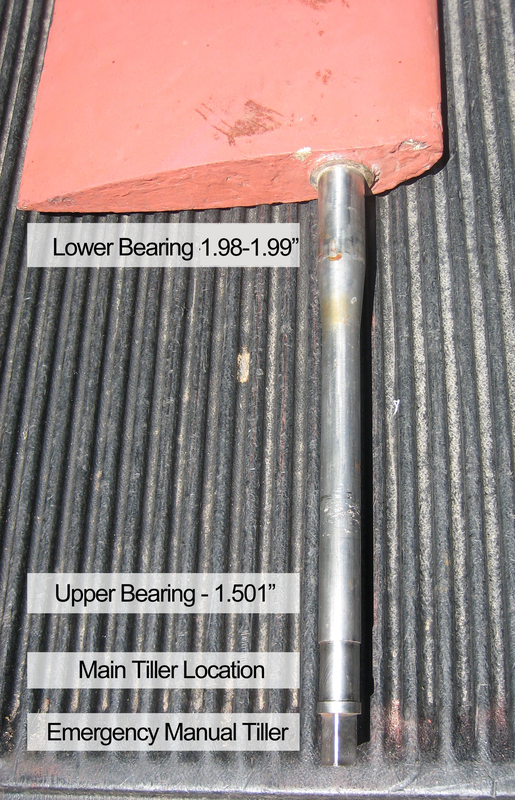 And not surprisingly, this bearing is the same inner and outer dimension as the outer cutlass bearing. 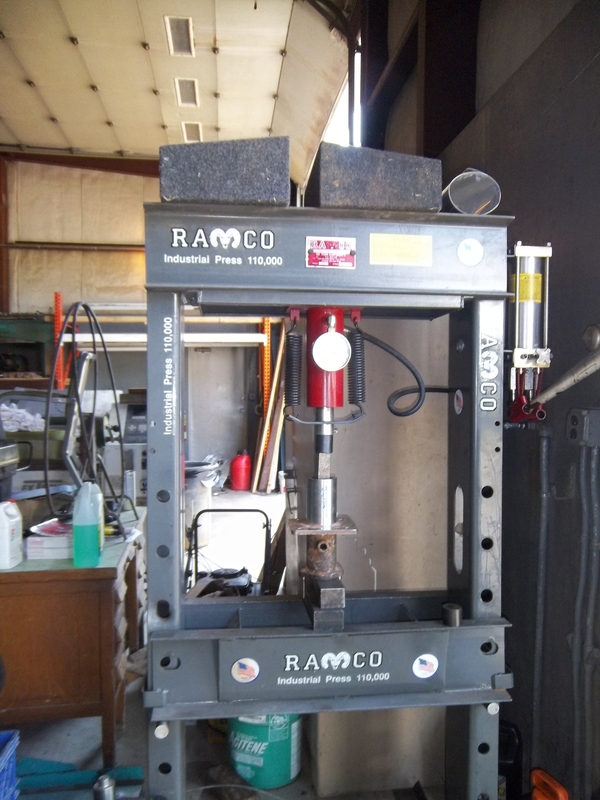 The inner diameter of 1.75″ is easy enough. It’s that outer dimension that makes things interesting. It’s 62 mm or 2.44″, a size we’ve discovered is harder to locate than you’d first imagine. 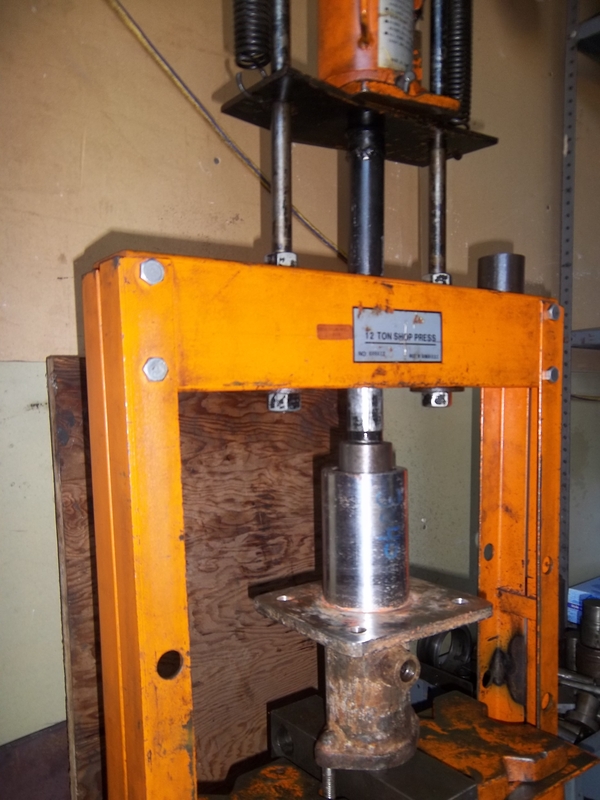 And that’s where we are now, trying to track down two cutlass bearings with outer diameters of 62 mm. We have a plan B and even a plan C, but ultimately the ideal would be plan A – replace these bearings apples to apples. 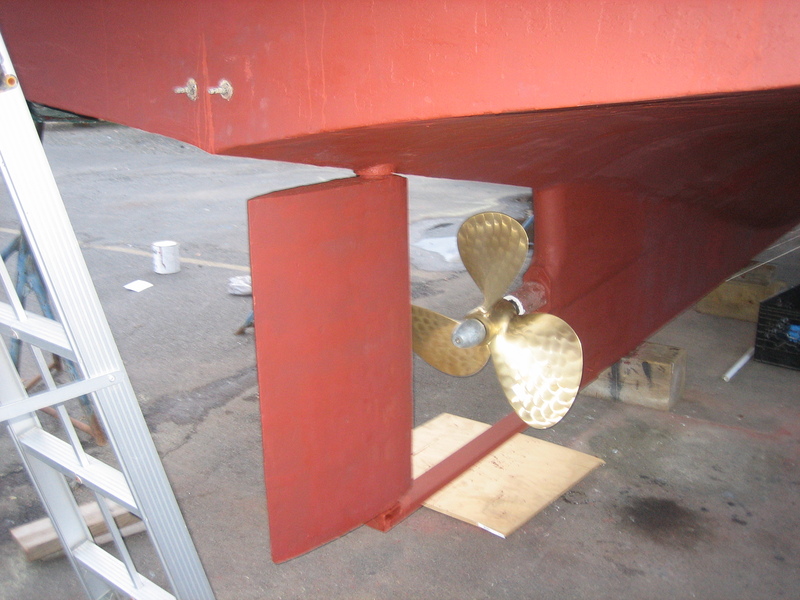 Surely with all the trawlers and sailing craft coming out of Hong Kong during the seventies and eighties, ours can’t be the only boat built with bearings of these dimensions. Update: presently we may have located a Duramax bearing with an outer diameter of 65 mm and an outer wall thick enough to be machined down to 62 mm. It’s a start but I’m still curious if there’s anything that starts out at a closer fit. …to repack the stuffing box WITHOUT sinking, despite Frank’s dire predictions. In fact, I didn’t see it as nearly as dramatic as he did, then again, I suppose critical is in the eye of the beholder. Yes, we had repacked it earlier this spring, and it seems I was right, it was a bit too snug the first time, warmed up more than I liked, and the choice was made to switch from flax to synthetic with teflon. I was convince we could do this without short-hauling, and only a small bucket of water came through in the process. 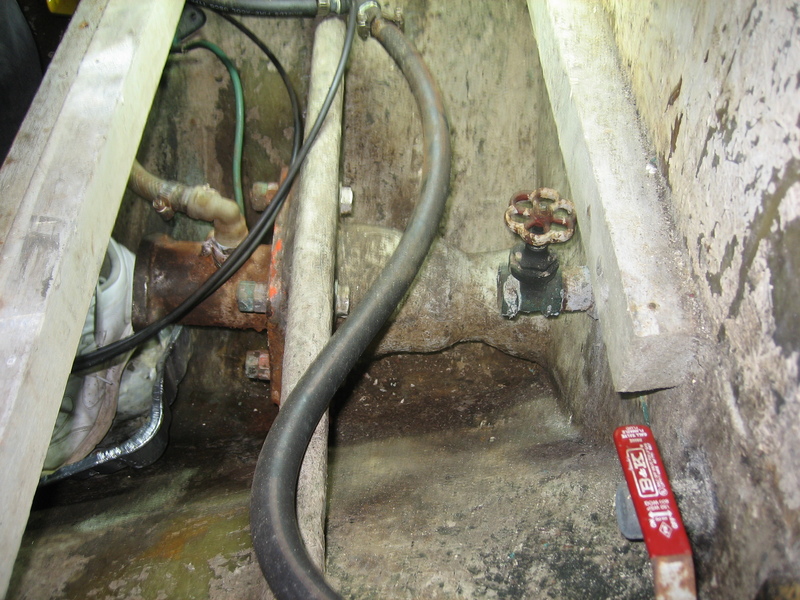 The bilge pump could have easily kept up, no sweat. 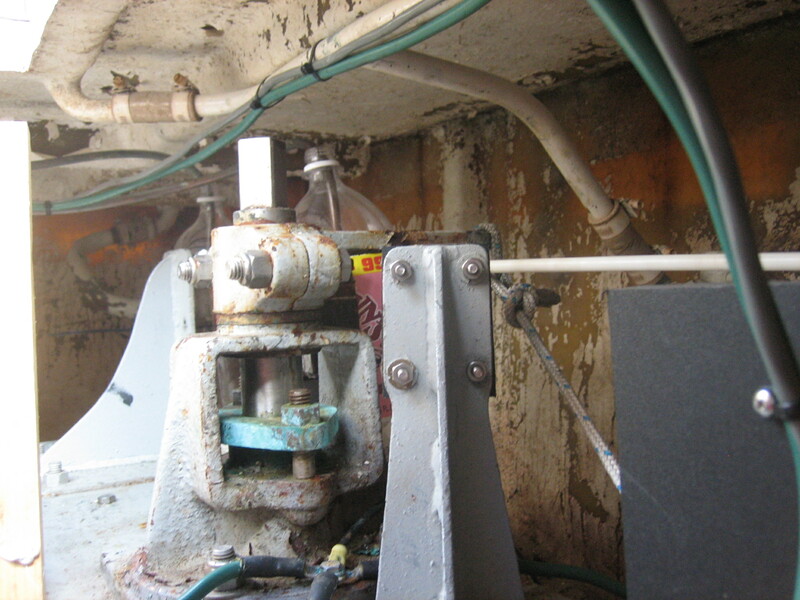 And now both rebuilt helm pumps and the ram have been swapped out for their new replacements, and all the hydraulics work perfectly, BUT the rudder still seems to hang up at one point, which, we suspect, is that bolt where the rudder sets into the skeg binding up. At the time of the Great Keel Ordeal, nowhere around here had the correct style bolt for the purpose, and Frank voiced concern that the one we did use could cause problems. Only one way to be sure… high tide tomorrow we short haul. I’ll keep my fingers crossed that’s all it is, because if it isn’t we have no idea what it could be, and we won’t be moving much for the rest of the summer. Ironically, had we realized we’d be short-hauling, we could have repacked the stuffing box then, and spared Frank some anxiety.